Could Volkswagen’s forthcoming electric hippie van win back a fuming public? Late last week the Environmental Protection Agency announced that German automaker Volkswagen had been evading official emissions tests and was going to have to fix or recall nearly half a million VW and Audi cars in the U.S. The software in these vehicles, which were manufactured between 2009 and 2015, had what's called a "defeat device" that could mask the cars’ emissions of the pollutant nitrogen oxide, which contributes to the creation of ozone and smog, and is a known public health hazard. The situation has only gotten bleaker for the iconic automobile manufacturer in the ensuing days. On Tuesday, Volkswagen said up to 11 million of its diesel cars worldwide have the deceitful software installed. The embattled automaker said it had set aside $7.3 billion in the third quarter of the year to cover the costs of fixing cars to meet pollution standards, as well as to pay expected fines and lawsuits. Volkswagen, the second-largest car manufacturer in the world, could face up to $18 billion in fines in the United States. The company has lost about one-third of its market capitalization in the last week. These vehicles were meant to offer superior handling, good mileage, and low pollution. Now what they are offering is grave disappointment and a public relations nightmare. The deception is certain to lead to a lot of customer lawsuits from angry drivers … one Seattle-based law firm said it had already filed a class-action suit on behalf of car owners accusing Volkswagen of fraud, false advertising and violating consumer rights. "Our company was dishonest, with the EPA, and the California Air Resources Board, and with all of you," said Horn on Monday night. "We have to fix those cars … and we have to make things right, with the government, the public, our customers, our employees, and also very importantly, our dealers." How can the renowned automaker start to rehabilitate its image after such an epic and bad-tasting scandal? Could the answer to the future lie in the company's own past? Front view of the VW Bulli, or Microbus, concept vehicle, on display at the 2012 Canadian International Autoshow in Toronto, Canada. 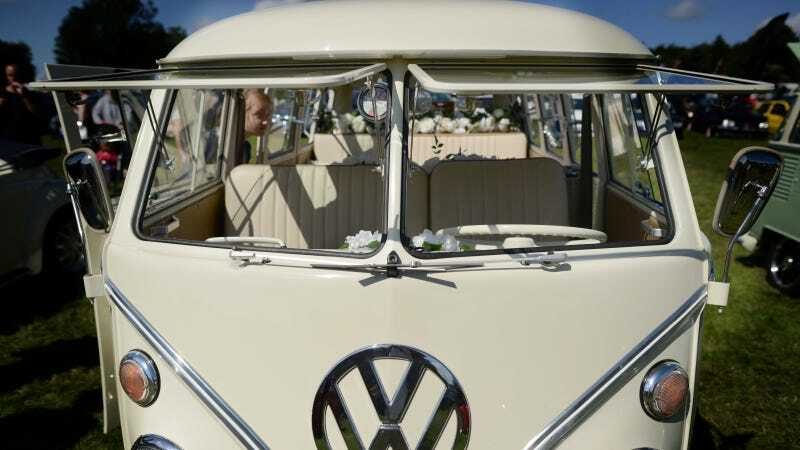 Volkswagen is perhaps best known in the U.S. for its Beetle and Bus, or Campervan. Both vehicles came of age in the 1960s at the same time an especially influential–and environmentally oriented—generation was also doing the same. And their legendary appeal has persisted into the present. While VW remade the original Beetle in 1997 (production has since been discontinued) the bus, or hippie van, has never been properly initiated into 21st century. That could soon change, and with that change there may be hope for the beginnings of a willingness to re-imagine VW as it was before the "clean diesel" episode. As Autocar reported earlier this month, VW recently confirmed its plans to reveal an updated version of the bus at the Consumer Electronics Show in Las Vegas in January. Even more enticingly, the Microbus will feature an electric drive system that will include the "latest lithium-ion battery technology" which could provide an electric range of between 250 and 310 miles depending on driving conditions. The Microbus will also be available in gasoline and diesel-powered variants. As Autocar reports, "Volkswagen’s plans to resurrect the Microbus form part of a broader commercial vehicle strategy aimed at significantly bolstering its sales performance in the U.S. market." That was written shortly before the crippling revelation that VW had been purposefully breaking the law and drastically misleading consumers. There will be many reverberations from this period in the company's history in the years to come, how the plan for the reinvented camper fits in is yet to be determined. The camper van will have a "retro treatment" to hearken back to the days of old, an era Volkswagen is probably dearly missing right now.